Arizona State University geoscientist Everett Shock has collaborated with a team of life scientists from Montana State University to discover a puzzle at the junction of geochemistry and biology. The puzzle, which has no solution yet, is: Why would a microorganism thriving in a hot spring draw its energy from low-quality sources instead of rich ones? Shock, who is a professor in geochemistry in ASU's School of Earth and Space Exploration and the School of Molecular Sciences, has long studied questions of habitability as they apply to life on Earth, and to the potential for life on other planets. "The team isolated this organism, which is a member of the Acidianus genus, from a hot spring in Yellowstone National Park and cultured it in the laboratory," he said. "There it was given a choice of three different geochemical energy supplies." This microbe, Shock said, can get energy from combining hydrogen with sulfur, or hydrogen with iron, or sulfur with iron. In the experiments the team carried out, hydrogen and sulfur supplied the least energy, while hydrogen and iron provided the most. "Surprisingly, the organism grew best on the lowest energy supply — and it grew the worst with the richest energy material," Shock said. The scientists' report was published July 3 in Nature Geoscience. The lead author is Maximiliano Amenabar of Montana State University; besides Shock, the other authors are Eric Roden (University of Wisconsin), and John Peters and Eric Boyd (both Montana State). "The results were quite counterintuitive," said Shock. "It's only natural to expect that in any environment, the 'big deal' energy sources will be supporting the most organisms, and the feeble sources — well, you wonder if they are supporting anything at all." It turns out, he explained, that in a genetic sense, it may be costly for the organism to go after the big-energy supply. "It's like mining," he said. "You can have a rich ore deposit, but if extracting it costs more than you can get for it, it's not worth pursuing." And in microorganism terms, Shock said, "biological cost may come down to availability. Perhaps the low-energy source is more reliable in nature than the high-energy one." Shock suggested that reliability could "tune" the microorganism's metabolism to the energy source that's always available. But apparently not exclusively, he added. "The organism is also capable of using these other energy sources. However, maybe using them takes more work, so the organism grows more slowly with them." The focus of future research on this organism will be to assess in detail the energetic costs. Its recently completed genome will aid the research.. Shock concluded, "We don't know for sure why this organism thrives best on low-energy food sources — but now the task becomes finding that out." 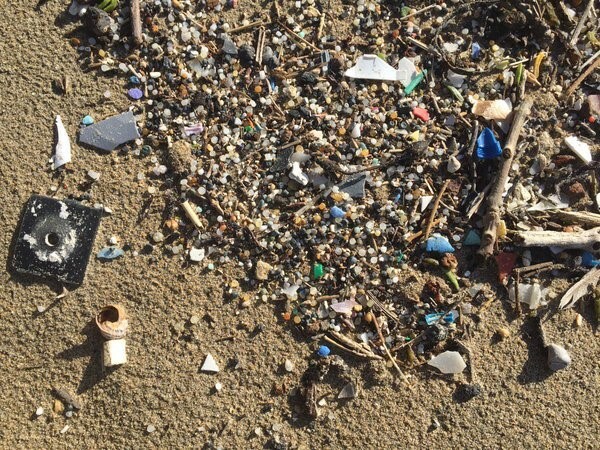 Q&A: How do microplastics affect the planet? As of July 1, 2017, manufacturers must phase out plastic microbeads from personal-care products sold in the United States. Answer: Microbeads are small, round plastics with a range of purposes, but they mostly are found in the realm of cosmetics. They are used often as exfoliates and began production in the early 1970s. Q: How do microbeads affect water systems and the ocean? A: As microbeads are most commonly used in beauty products, they eventually make their way down sinks or showers and from there can end up in a multitude of delicate ecosystems ranging from wetlands and lakes to oceans around the world. Because of their small size, they are often difficult to filter and remove from wastewater treatment plants through which the discarded water passes. Q: Microplastics are an issue all over the world. What’s the difference between microbeads and microplastics? A: This is a great question. Microplastics in general refer to plastic pieces less than 5mm in size. This can include beads, fibers and broken-down plastic fragments. What makes microbeads different is that they’re intentionally manufactured to be small in size in order to best serve their purpose, such as exfoliate skin. This is different from other types of microplastics that we find, which are a result of larger-than-5mm plastic pieces that are subjected to some type of degradative force, i.e. sunlight, and then are broken down over time into smaller pieces. Q: How do microplastics, including microbeads, affect animal life? A: This is a very scary question for researchers in my industry to answer. At this point, we have noted many deleterious qualities that microplastics have. For example, they can accumulate contaminants at very high concentrations, a range of organisms have been known to be ingested them, and these particles have been found all over the world from lakes to the bottom of the ocean. By linking these harmful characteristics together and studying the wide distribution of the plastics themselves, we’ve got a big problem on our hands that we are only just now starting to grasp. There are a lot of unanswered questions, but I can tell you that the more we learn, the scarier it is for the planet and human beings alike. Q: What can consumers do to stop the proliferation of microplastics? A: Good question! Obviously plastic has its merits and provides many services. We can’t walk through a hospital without seeing plastic syringes and IV bags, which have both helped to reduce the spread of disease or germs. In these cases, for now, plastic is needed, but perhaps so are better recycling programs for these items. The best advice I can give is what I implement within my own life: I focus on plastics that are relatively unnecessary. Disposable plastics are a huge problem, and we commonly find them as pollution within the environment. Examples being plastic bags, straws, silverware and various Styrofoam products. There are easy-to-find and cost-friendly replacements for all of these, which can help us decrease plastic pollution in the environment. We also can reach out to state and local governments to see what we can accomplish as a community. This could be helping restaurants transition away from disposable silverware or incentivizing reusable-bag uses in a grocery store, or even organizing a beach cleanup. Much can be accomplished when we team up and work together to not only reduce plastic use but find more sustainable alternatives that do not have a negative impact on businesses or consumers. Additionally, I take bamboo silverware, reusable bags and a metal straw everywhere I go to show people it’s doable, cheap and a small step towards reducing our plastic waste.